The Queen has been pleased to give her formal approval to the appointment of His Royal Highness The Duke of York as Colonel of the Grenadier Guards. The Grenadier Guards who were formed in Flanders in 1656 by King Charles II as His "Royal Regiment of Foot Guards", has fought in almost every major campaign of the British Army. They later became known as the First Regiment of Foot Guards, and now bear the title The First or Grenadier Regiment of Foot Guards in honour of their defeat of the Grenadiers of the French Imperial Guard at the Battle of Waterloo in 1815. The bearskin caps seen on ceremonial duty are worn in recognition of that victory. The Grenadier Guards boast 78 Battle Honours having served with distinction in campaigns throughout British history, particularly in the Napoleonic, Crimean, Boer, First and Second World Wars, winning a total of 14 Victoria Crosses and one George Cross. In the 21st Century they continue to serve their country with distinction and were one of the final units involved in ground combat in Afghanistan. A formidable force of hard and soft power the British Army’s Grenadier Guards are admired and recognised around the world. Prince Andrew had wanted to become a helicopter pilot from an early age. In 1979, upon completion of A-levels, His Royal Highness joined the Royal Navy on a short-service commission as a Seaman Officer, sub-specialising as a Pilot. 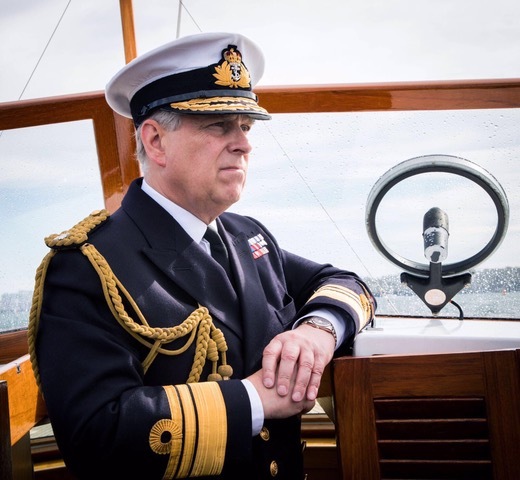 Midshipman Prince Andrew passed out of Britannia Royal Naval College Dartmouth in 1980, before undergoing fixed-wing and helicopter flight training at RAF Leeming and Royal Naval Air Station Culdrose respectively. In 1981, His Royal Highness was presented with his ‘Wings’ and the award for the best pilot by The Duke of Edinburgh. Sub Lieutenant Prince Andrew converted to the Sea King helicopter, before joining his first front-line unit: 820 Naval Air Squadron (NAS) embarked in HMS INVINCIBLE. In April 1982 the unit sailed as part of the Task Group to the South Atlantic to regain the Falkland Islands. During the conflict His Royal Highness flew missions including Anti-Submarine Warfare (ASW), Anti-Surface Warfare (ASUW), inter-ship Helicopter Delivery (HDS), Search and Rescue (SAR) and casualty evacuation. Upon return to Portsmouth in September 1982, HMS INVINCIBLE was met by The Queen and The Duke of Edinburgh. The Duke’s active service with the Royal Navy spanned twenty-two years during which, as Lt Cder The Duke of York, he was selected to command the Hunt Class Mine Counter Measures Vessel HMS COTTESMORE. His Royal Highness returned to flying duties, taking up an appointment as Senior Pilot of 815 NAS at RNAS Portland, where he served until October 1996. In January 1997, he was appointed to the Ministry of Defence as a Staff Officer in the Directorate of Naval Operations. Promoted Commander in 1999, he took up an appointment within the Naval Staff, before departing from active service with the Royal Navy in July 2001.